Kauri Cliffs was designed and built by David Harman of Golf Course Consultants, Orlando, Florida. The par 72 championship golf course measures 7,119 yards / 6,510 metres and offers five sets of tees to challenge every skill level. Fifteen holes view the Pacific Ocean, six of which are played alongside cliffs which plunge to the sea. The beautiful inland holes wind through marsh, forest and farmland. Kauri Cliffs is currently ranked #39 in the world by Golf Digest Top 100 Greatest Golf Courses in the World. 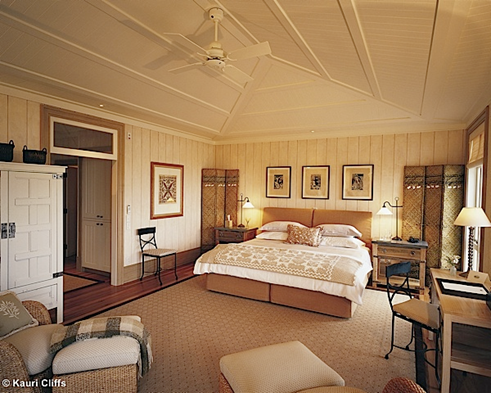 Kauri Cliffs recently underwent a renovation from world renowned golf course architect Rees Jones. The 5th hole received a complete redesign and was transformed from a long, uphill, forced carry par-3 to a short "drop shot" par-3. Other notable changes were the addition of tees on the 2nd and 9th holes and a bunker renovation on the 4th hole. The golf complex includes a world-class practice range, putting and chipping greens, a well stocked golf shop, and ladies’ and mens’ locker rooms. Premium ladies’ and mens’ rental clubs are available. 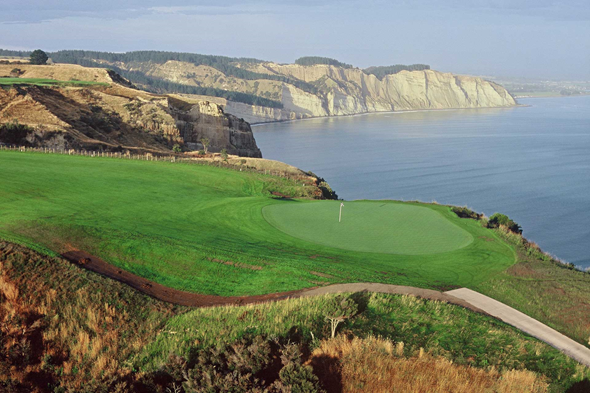 In 2008 and 2009 Cape Kidnappers and Kauri Cliffs hosted the Kiwi Challenge, our PGA TOUR Challenge event featuring four of the top PGA TOUR players under the age of 30. Hunter Mahan won the 2008 event, beating Anthony Kim in a playoff. In 2009, Anthony Kim was victorious in a playoff over Sean O’Hair. 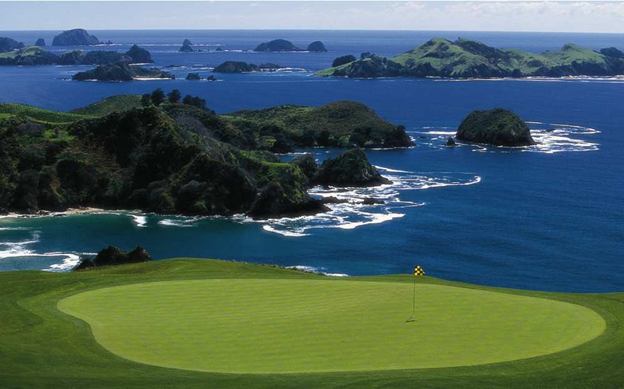 Kauri Cliffs also hosted the “Shell’s Wonderful World of Golf” match in 2003 between Kiwi icon Michael Campbell and American legend Fred Couples. 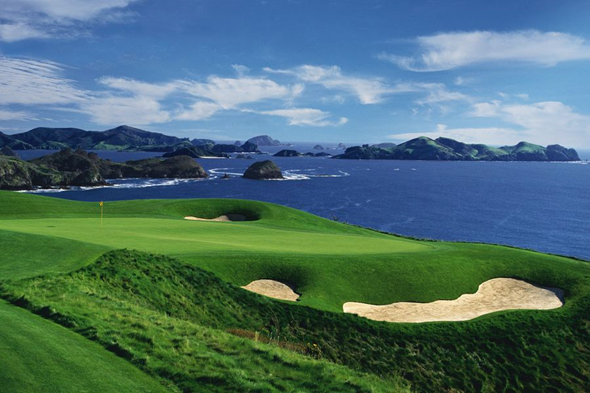 Along with a variety of the finest in brand name golf apparel and accessories, the Kauri Cliffs golf shop is a great source of local made New Zealand cashmere and wool products, as well as local artwork and sculpture. The range of clothing and equipment features brands such as: Fairway-Greene, Polo, Adidas, Nike, Peter Millar, Cross, Tolaga Bay, Imperial Headwear, and Titleist. The shop is staffed by Class “A” members of the New Zealand and United States PGA who know their game and are happy to assist in any way they can. 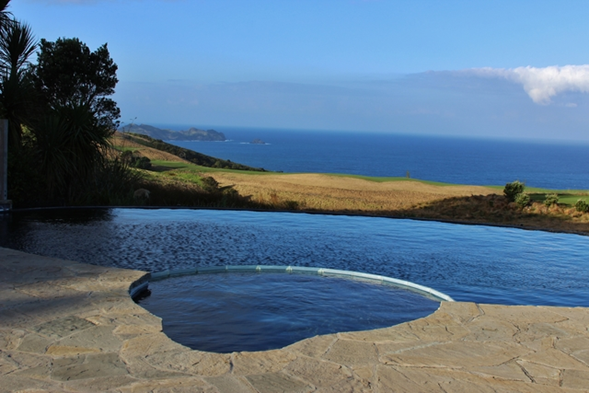 Set on 6,000 acres near Matauri Bay, Northland, The Lodge at Kauri Cliffs affords spectacular 180-degree views of the Pacific Ocean. Cape Brett and the offshore Cavalli Islands are part of the panorama which can be viewed from the verandas, lounge, card and dining rooms. The Lodge accommodation has 22 guest suites, and a Two Bedroom Owner’s Cottage and is just a 45 minute flight from Auckland. 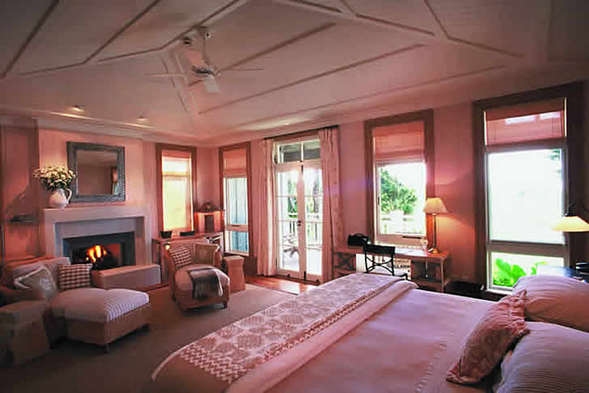 Every suite offers its own private porch, bedroom with sitting area and open fireplace, walk-in wardrobe and ensuite. The cottages are nestled in a native forest overlooking the golf course and the Pacific Ocean. 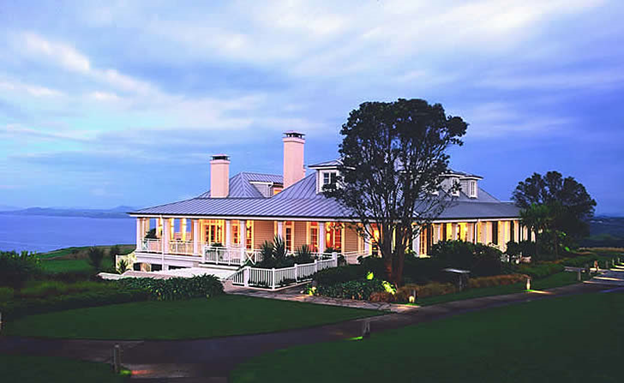 Accommodation at Kauri Cliffs is in eleven outlying guest cottages, each with two guest suites providing twenty-two suites. Every suite offers its own private porch, stylish and cosy bedroom with sitting area and an open fireplace. Other stand-out features are generous walk-in his and hers wardrobes with plenty of storage and a luxurious bathroom with a shower, bathtub and his and hers vanities. 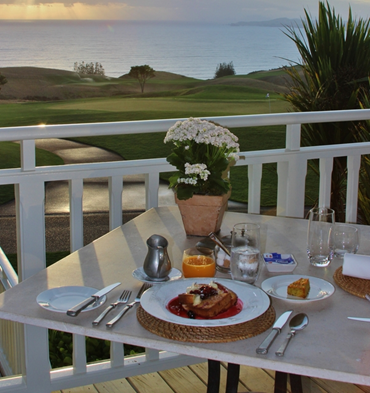 The cottages are nestled on the edge of a native forest with spectacular views overlooking the ocean and golf course. The feel is more of staying in a well-designed guest room in a private home, thus is the attention to detail in all aspects of each suite's interior design. 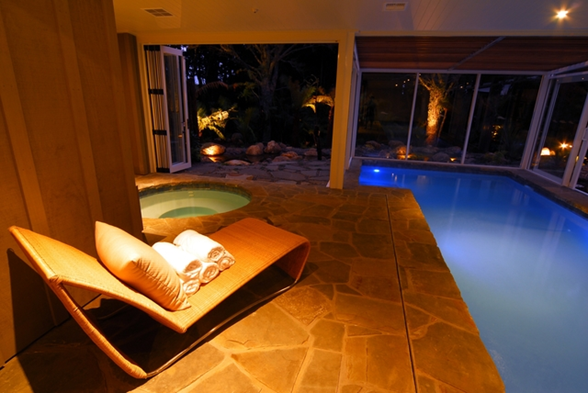 Aside from the world class golf course, The Lodge at Kauri Cliffs’ also offers two Astroturf tennis courts, a beautiful full service spa set in a totara forest with a fitness centre with an indoor lap pool and jacuzzi, and a stunning infinity swimming pool with spectacular views. 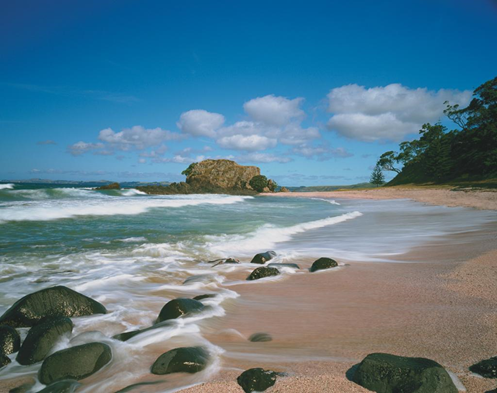 Kauri Cliffs also has three secluded swimming beaches, including the famed Pink Beach where regular barbecues are held in the summer months. Private a la carte dining is available in the main lodge and on its verandas, or in a number of appealing locations within the lodge. Gourmet picnics can also be arranged and enjoyed around the expansive grounds. Mountain bikes, guided nature walks, fishing and horse riding are all popular activities on the property. 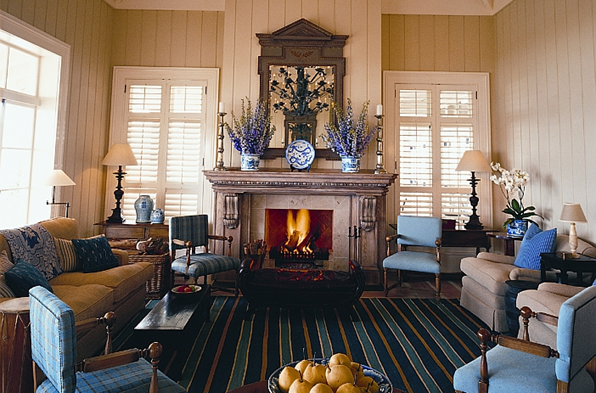 The main lodge, which overlooks the golf course and the Pacific Ocean, provides ample venues for relaxing including the beautifully appointed beamed living room, a spacious and comfortable meeting/TV room, a handsomely designed card room, and a small computer room. Gourmet a la carte dining is available in the main dining room or on the verandas. Breakfast is a buffet of local and imported fruits, home-made muesli and cereals, yoghurts and freshly baked muffins. In addition, a hot menu featuring eggs, pancakes, crisp bacon, ham, sausages and ricotta hotcakes may be ordered. A formal three-course lunch is available. Alternatively, there are a variety of sandwiches, salads and desserts from which to choose. Wonderful picnic sites abound on the property. We have three secluded beaches, several waterfalls and stands of magnificent bush. A choice of delicious picnic lunches are available. Pre-dinner drinks are an excellent way to meet fellow guests. Hot and cold canapes and a wide range of wines, beer and spirits are available. 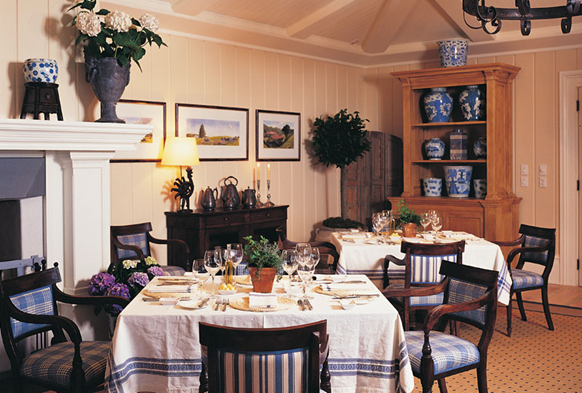 Our dinner menu changes nightly and features local produce and seafood. The best New Zealand lamb and beef are served. Executive Chef Barry Frith oversees the culinary team. Our Pastry Chef is a master of exotic and tempting desserts. Gentlemen are required to wear jackets during cocktails and dinner. Jackets are available to borrow. Room service and private dining are available. 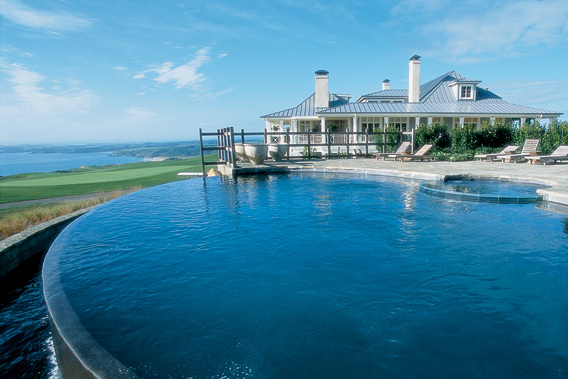 Condé Nast Traveler (USA) readers have chosen The Lodge at Kauri Cliffs as the No. 1 Lodge/Resort in the World on the 2013 Readers’ Choice Awards list of Top 100 Hotels in the World with a near-perfect score of 99.2! 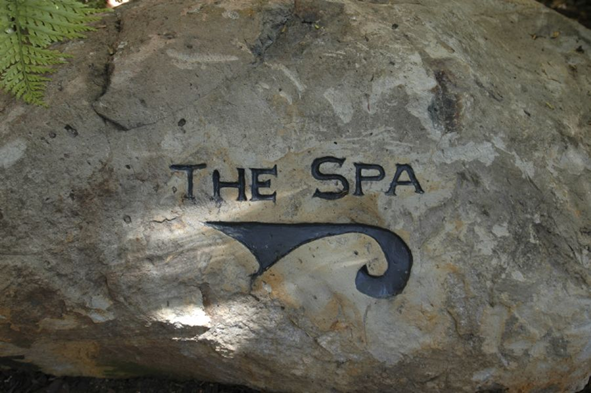 Over 79,000 readers voted this year, naming Kauri Cliffs as their #1 resort in the world.